PATHOS Delta is the result of Milestone’s 20 years of know-how in applying microwaves to tissue processing. It provides the ideal combination of automatic processing performance, reagent efficiency and environmental sensitivity, with the morphology and quality that you expect. PATHOS Delta dual retort tissue processor never moves paraffin wax, resulting in the tissue processor with the highest uptime by design. It runs xylene-free, eliminating solvent degradation of the paraffin. 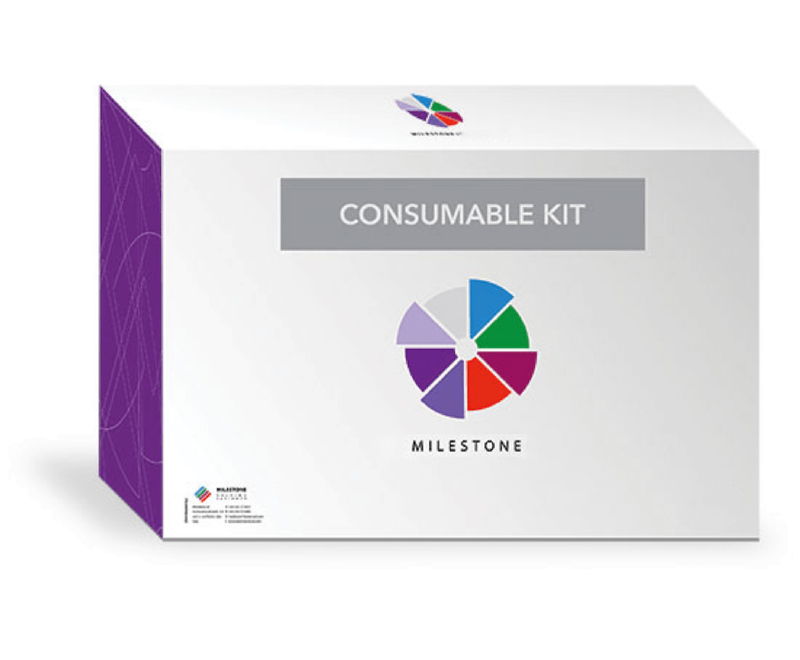 Long reutilization of paraffin wax, along with reduced consumption of reagents overall, delivering a dramatic cost saving. Wax is not pumped through the system hence PATHOS Delta delivers a higher uptime than conventional tissue processors by design. Run ultra-rapid processes during the day and set for an overnight or over weekend delayed start protocol. Enables more even workflow in the lab. No pumping of wax, thus no post-run cleaning cycle. No exposure to both toxic Xylene and Carcinogenic Formalin fumes. Wax can be reused for a long period of time with a direct cost saving. Additionally PATHOS Delta has a lower consumption of alcohol than conventional tissue processors. PATHOS Delta can use any fixative already used in the lab. Use of your current fixative enables you to perform all downstream tests (IHC, FISH, ISH, etc.) using the same standard validated protocols. 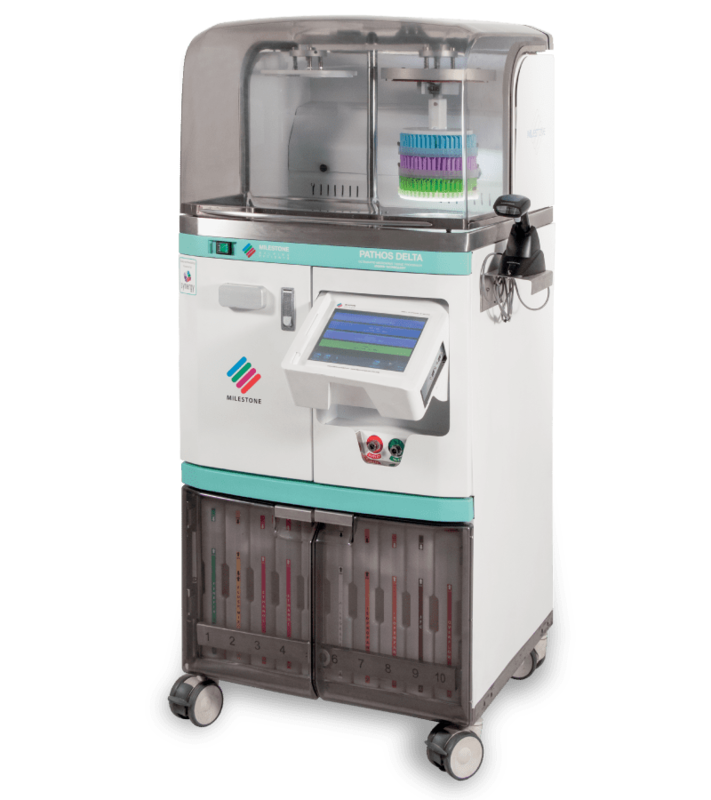 PATHOS Delta can operate with resistance heating only, and processes breast tissue for assessing HER-2 in full compliance with CAP/ASCO guidelines and FDA HER-2 approved testing, in accordance with heating mode, temperatures, and reagent types. PATHOS Delta is compatible with Synergy, a revolutionary patented method to automatically embed tissues as part of the processing protocols.